Announcer: Meet the Doctor. He's a wonderful chap... all of them! 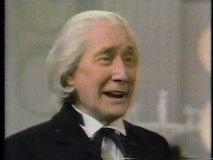 Second Doctor: We could be playing the Game of Rassilon at this very moment! 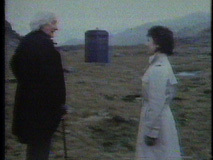 Third Doctor: I knew it, a trap! Announcer: It's a very special Doctor Whoadventure when the original Doctor teams up with all four of his regenerations. Announcer: Join the Doctors as they encounter Daleks, and Cybermen, and much more, in a real who's who. Cyber-Leader: You will accompany us. Fifth Doctor: Sorry, must dash. 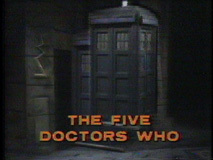 Announcer: Celebrate twenty years with "The Five Doctors," Wednesday at 10:30.